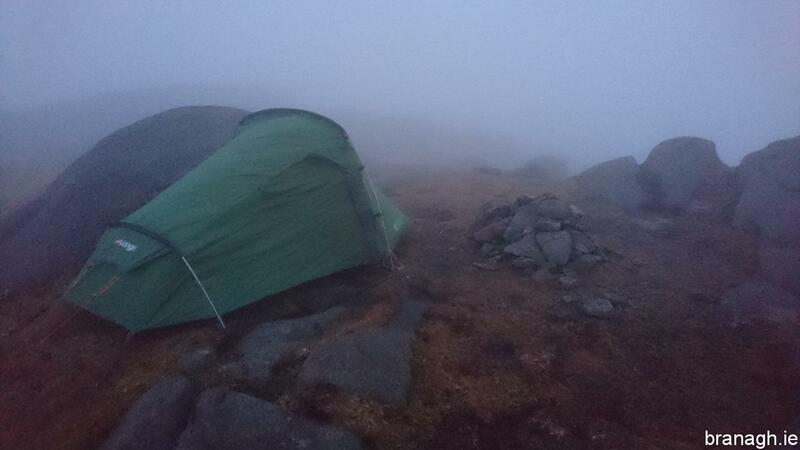 It has almost become routine now to leave work and drive straight to The Mournes for a camp. I had spent some time through the day trying to decide on which summit to camp. The forecast was for light wind throughout the night, no more than 20mph which meant I could camp on any totally exposed peak without the need for shelter. I set my mind on Slieve Corragh. I set off along Trassey Track and up to Hares Gap. There was no rain but it was very misty / cloudy. I was well into thick cloud long before I even reached Hares Gap. For some reason I left the car without my gaiters, thinking I would not need them. That was a clear mistake as I started hiking along the Brandy Pad and very quickly the bottom of my walking trousers became covered in mud. I took a left off the path and decided to start heading directly uphill to meet the Mourne Wall which I could then follow to the summit. There was still some snow along the wall as I got closer to the summit. 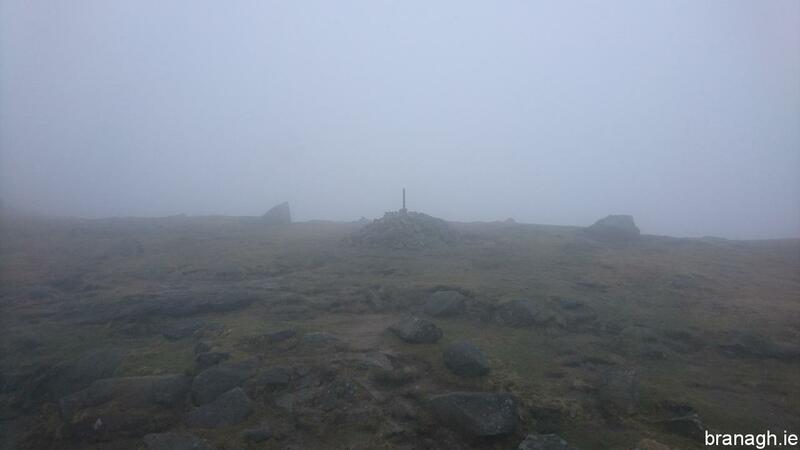 The summit of Slieve Corragh is large and mostly flat with a little raised section at the end closest to Slieve Commedagh. This is where the summit cairn is located and where I was able to pitch the tent. Hares Gap was in a blanket of thick cloud. The evening was largely uneventful. I had my usual Chilli Beef Pot Noodle snack. The wind was very light which is always a pleasant change. Sleeping was not a problem. I have a metal camping mug which was beside me in the tent. In the inside pocket of the tent I had the bag from the tent itself. This bag has a plastic buckle which was hanging out of the pocket and dinging against the side of my camping mug as the tent moved in the light wind. It sounded like a bell but I didn’t work out what it was until morning as I was too comfortable to roll over and investigate through the night. I think the noise became part of my dreams at one point. 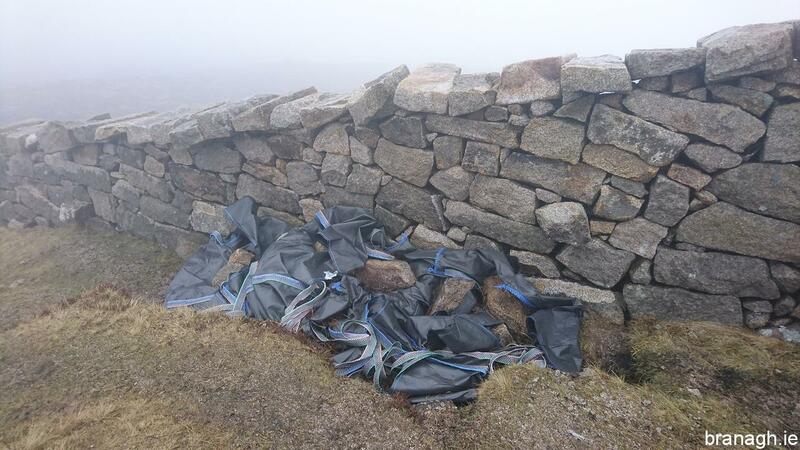 The excellent work to restore the Mourne Wall. Probably the last of the snow for this year. The forecast the next day was for sunshine so I had been hoping that maybe I would wake up to the stunning view down across Ben Crom reservoir. Unfortunately the cloud was even thicker the next morning and I was not treated to any view at all. On the hike down I noticed an area of the Mourne Wall where the excellent restoration work was being carried out. 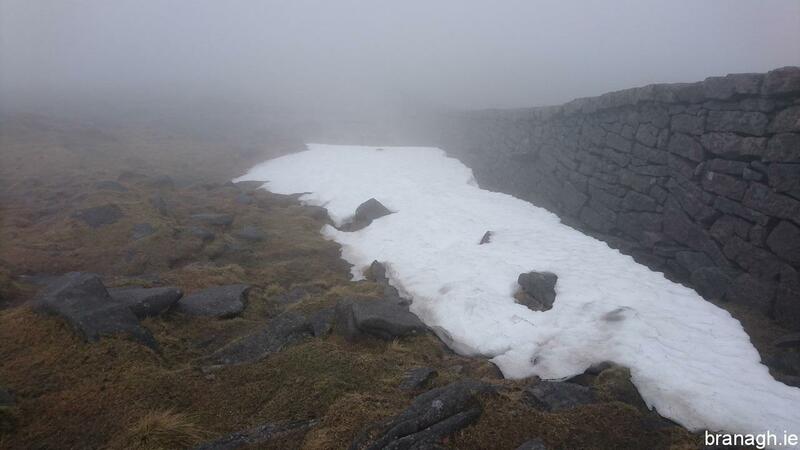 There was also still some snow along the wall despite being well into April.